Pope Francis was born Jorge (George) Mario Bergoglio to parents of Italian descent on 17 December 1936 in Buenos Aires, Argentina, and was baptized at Christmas that year. 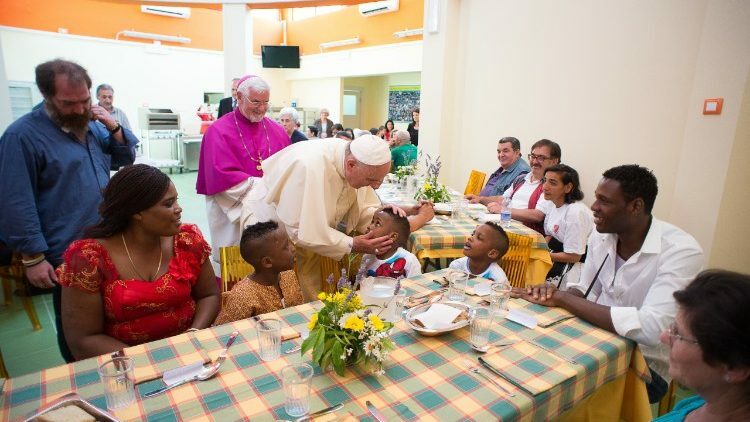 Pope Francis on Monday marked the feast of his namesake, Jorge (George), in his characteristic unassuming way, spending time with the needy and homeless of Rome, the Office of Papal Charities said in a brief note. It said that on this occasion it would distribute 3000 ice creams to the poor and homeless who daily come to soup kitchens, dormitories and other places run mostly by Caritas in the capital. Pope Francis was born Jorge Mario Bergoglio to parents of Italian descent on 17 December 1936 in Buenos Aires, Argentina. He was baptized Jorge, the Spanish for George, at Christmas that year in the Basilica of Mary Help of Christians in Buenos Aires. =After graduation, he entered the Jesuit novitiate on 11 March 1958 and went for further studies, including philosophy and theology, and also taught literature and psychology. He was ordained a priest on 13 December, 1969. On 22 April, 1973 he made his final vows with the Jesuits, serving the society in various capacities such as novice master, professor, provincial consultor, rector and provincial superior for 6 years. After that he resumed his teaching and pastoral activities. St. John Paul II appointed Jorge Bergoglio the Auxiliary of Buenos Aires on 20 May 1992, and on 3 June, 1997 was raised to the rank of Coadjutor Archbishop with the right of succession. After the death of Cardinal Antonio Quarracino, Jorge Bergoglio became the Archbishop of Buenos Aires on 28 February 1998. Three years later, at the Consistory of 21 February 2001, St. John Paul II created him Cardinal. Twelve years later, he was elected Supreme Pontiff on 13 March 2013 and assumed the name Francis, after the popular 13th century Italian saint from Assisi.